Hyderabad: Shobha Yatra, a massive procession, taken out on the occasion of Rama Navami attracted thousands of youngsters from in and around the city on Sunday. 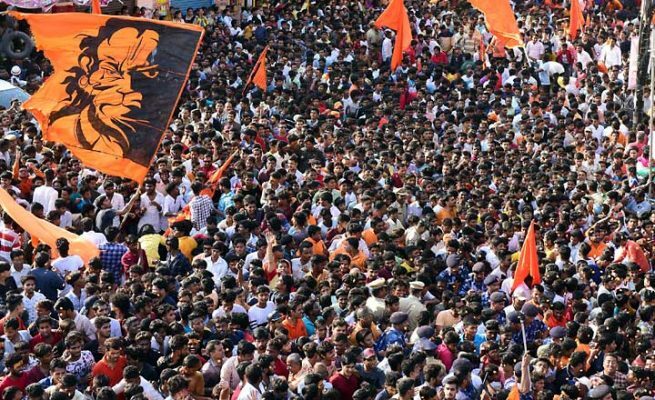 The procession started from Sri Ram temple, Seetharambagh, and traversed through Mangalhat, Dhoolpet, Begum Bazaar, Siddiamber Bazaar and Koti before winding up at Hanuman Vyayamshala grounds. The procession was led by Dr Bhagwanth Rao. Another procession was taken out on the same route by BJP legislator T Raja Singh. The entire route was decorated with saffron flags and banners. The procession had many girls and boys dressed up as religious figures. Many idols of gods were made specially to add glitter to the procession. Along the route, several organisations had put up stages to welcome the procession and also set up camps to distribute food, water and other cool drinks to participants. No untoward incident was reported during the procession; around 5,000 policemen were deployed for its peaceful conduct. Senior police officials monitored the procession from key places on the route while Hyderabad Commissioner Anjani Kumar camped near Siddiamber Bazaar mosque. Several officials monitored the procession from the Command and Control Centre at the CP office building. These processions apart, Sri Rama Kalyanam programmes were organised in temples where the celestial wedding of Lord Rama drew devotees in large numbers.